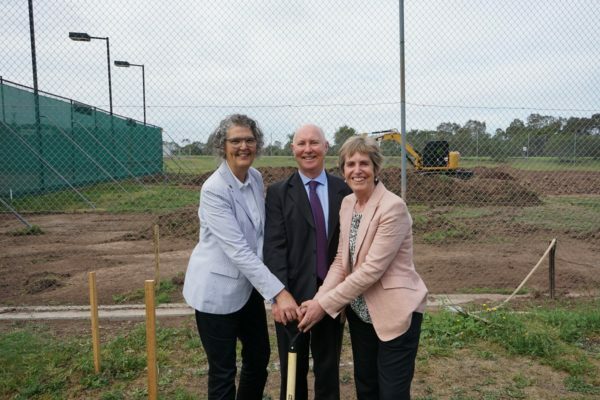 Wellington Shire Mayor Carolyn Crossley, Sale Tennis Club president Robin Lowe and Latrobe Valley Authority CEO Karen Cain turn a sod to mark the start of construction on the redevelopment. The Sale Tennis Centre will be redeveloped so it can attract higher grade tournaments, and provide improved amenities for community use. The works include upgrades to seating and shared pathways to connect facilities and court lighting to improve amenity for evening games. The reconstruction of 12 tennis courts and ground works will include four new red porous surfaces, meeting official requirements for ITF-level tournaments, and eight courts upgraded to improve club-level competitions. Construction on the redevelopment has begun, with local contractors RAL Constructions appointed for the pavilion works – using local subcontractors – and Drouin based Meluca Group carrying out the court works. The Victorian Government will supply $1 million, to support Wellington Shire ($650,000), Tennis Victoria ($150,000) and STC ($550,000) completing major upgrades to the centre. The redevelopment is due for completion by mid 2019 and is one of seven major infrastructure projects being funded by the LVSCI. Complementing the project, Sale Tennis Club will also benefit from reduced energy costs after receiving a $40,313 grant from the LVA’s Community Facility Fund towards the installation of an additional solar power and new battery storage system. Wellington Shire Council is managing the project.